We know that selecting the right summer camp for your child is an important decision that we hope will last for many years. If you have any questions about our programs please feel free to reach out anytime by email, or even better give us a call at 860.379.2782, we would love to chat! Traditional overnight camp is a time filled with moments of pride, fun, friendship, and self-confidence. Parents tell us their kids gain independence; campers tell us they have a blast! At Camp Jewell YMCA we know that both of these are true—and along the way, we create amazing memories that will last your child a lifetime! The staff and counselors of Camp Jewell YMCA know how blessed we are to call this place our home. Camp isn’t simply a job for us—it’s our passion! 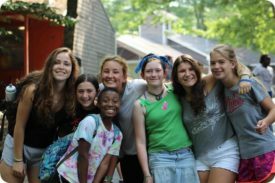 Our nationally known resident camp programs provide youth with an opportunity to build meaningful and lifelong relationships with fellow campers and staff. Campers become part of a dynamic camp community that fosters independence, skill building, and imparts positive values. Each summer we create an exciting camp culture that has a positive and lifelong impact on our young campers. We intentionally develop a diverse camp community where your camper can meet children and staff from many backgrounds. We teach campers to be independent and challenge them to try new activities—all while having a healthy dose of fun! Our counselors are not just great role models; they are super heroes to our campers! They help disconnect kids from technology by teaching them to appreciate the natural beauty of camp and to be proud of who they are as a real live person, rather than some virtual version of themselves on social networking sites. We offer two-week options for our youngest campers ages 7-9 in what we call our Bandit Village. This is where your child’s resident camping tradition begins! With one staff member for every four campers and a schedule that focuses on an introduction to overnight camp, you can rest assured that your child will be asking you to stay at camp when it comes time to leave. Our Bandit Village has a slightly different schedule that involves two activity choices each week along with swim lessons. For older campers ages 10-14, we offer two-week sessions, although many campers opt for four weeks. Regardless of your child’s age, our counselors focus on each individual camper, ensuring a great experience whether your child is a first time or seasoned camper. Campers have the opportunity to customize their program each week by signing up for three clinic activities (one of which can be swim instruction). In the afternoon, they head to the waterfront for free swim and then also have a period for activities as a cabin group. Each day concludes with an all camp or village activity and then cabin devotions where campers reflect on the day’s experiences. The weekends are host to special all camp activities ranging from Carnivals, to Camp Olympics, to our World Series of Wiffleball! Plus, there’s time each day for siesta where campers have some quiet time to read a book, hang out with friends, and write letters home! Our oldest resident campers will be part of our Senior Village, the first step in our multi-summer leadership development program. They spend a week at camp building a strong community and participating in traditional camp activities. During the second week, they will go on an extended trip hiking, biking, or canoeing down the Connecticut River under the guidance of our experienced and certified staff. Trips are designed to be at an introductory level and staff spends time daily teaching skills prior to departure. Please note the camp director selects senior campers shortly ahead of time, and parents are notified before the session begins. Several of our campers choose to attend more than one session each summer. When those chosen sessions are “back-to-back,” campers have the opportunity to enjoy Camp Jewell’s holdover program. Holdovers run from 11:30am on Checkout Saturday until lunch on Check-in Sunday, and are supervised by summer camp counselors your kids already know. Our holdover program is more than just waiting around for the next camp session to start. 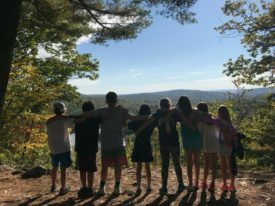 Campers get to enjoy some activities normally reserved for different programs and age groups, for example, they will all have the opportunity to climb Mt. Meggido, normally reserved for teens. Swimming, games, and arts and crafts round out the fun. Adequate time is set aside, however, for the campers to just rest and relax. Of course, parents are welcome to check out their children during the holdover weekend. Simply call ahead and indicate a pick-up time. We will insure your child will be ready to go and enjoy a dinner, movie, or activity with the family.